Other RAL colours on request, additional treatment for coastal atmosphere as variant. Suitable for mounting on top Ø76mm or Ø60mm (by ordering the correct version or adapter). Suitable for mounting on side Ø60mm or Ø42mm (by ordering the correct version or adapter). Variable tilting setting: 0° to +20° on post top mounting and -15° to +15° on lateral mounting, in 5° steps. Cable gland for Ø8 to 12mm cable. Delivered ready to install, complete with factory fitted integral gear tray, all supplied in a single carton. 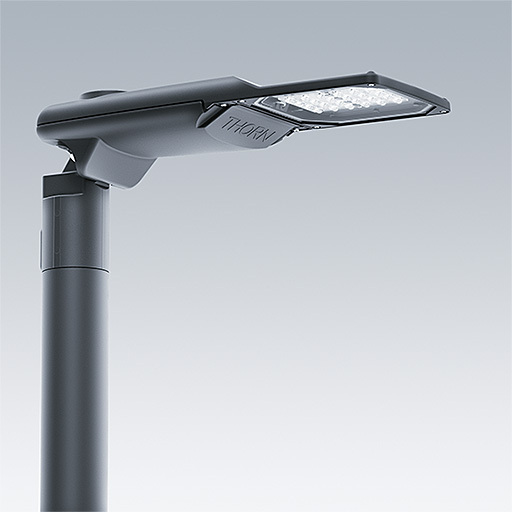 A state of the art, LED lighting lantern, addressing all minor road and street lighting applications. Thorn's rigorous focus on functionality needs and return on investment led to an easy to understand and service LED luminaire delivering performance and sustainability, thanks to its high quality of aluminium. It integrates the latest available technology of light source, gear and controls as an answer to the demand for energy savings and efficiency. Easy to understand, specify, install, maintain & control are all the concrete advantages offered by this rational led lighting solution ensuring the most optimised cost of ownership possible. Two spare parts defined: gear tray incl. driver, LED cover (incl. LED module, lenses and glass enclosure).